A very young California sea lion rests at The Marine Mammal Center. So far 2010 has been packed with an unusually great number of prematurely born California sea lions (CSL), Zalophus californianus. Females normally give birth on remote islands, away from people, however in 2010, pupping has occurred in crowded public places such as the public boat ramp at the Coast Guard jetty/breakwater in Monterey (photo 1), PIER 39 in San Francisco, and under the Boardwalk in Santa Cruz. Not only are these locations bustling with people, they also are far north of normal pupping areas. A newborn pup resting next to its mother on the boat ramp at the Monterey Coast Guard jetty/breakwater on June 7, 2010. Female CSLs normally give birth in large groups (rookeries) from the California Channel Islands, south to Baja California, Mexico during summer. They nurse their pups for several months before pups are weaned and begin to hunt for fish on their own. Pups are not normally born in Monterey Bay. During spring 2010 female CSLs were aborting premature pups along the central coast of California, far north of the normal pupping area. Pat Morris (UCSC) has documented ~300 premature CSL pup carcasses on Año Nuevo Island already this year. In a normal year, Pat usually sees 10 or 20 premature pups on Año Nuevo by this time. In the past few weeks, however, females have been giving birth to full-term pups along the central California coast. Many of these pups have been abandoned, but some were seen nursing shortly after birth (photo 2) and may survive. BeachCOMBERS and the marine mammal stranding network have documented the influx of CSL pups in Monterey and Santa Cruz counties, and the situation may be considered an unusual mortality event (UME). UMEs occur when the number of carcasses exceeds the threshold level (TL), which has been established by long-term beach survey data during 1997-2007. A newborn California sea lion pup sucking shortly after birth. Notice blood on female and umbilicus still attached to pup. Photo was taken 6/8/2010 at the Monterey Coast Guard jetty/breakwater launch ramp. Recent survey data indicates unusual CSL mortality events in April and June 2010 (Fig. 1). Preliminary results from June 2010 beach surveys indicate 41% of strandings were pups (CSLs less than 100cm in length, n=27). Data from The Marine Mammal Center indicate that live strandings of CSLs in Monterey and Santa Cruz Counties are similar in number to last year, but still far greater than normal (Fig. 2). The number of live and dead strandings of CSLs are greater in Monterey county than Santa Cruz county so far for 2010 (TMMC unpublished data and Robin Dunkin-McClenahan personal communication). The total number of stranded CSL pups examined in Monterey County through May 2010 already matches the total number examined during 2009 and greatly exceeds the number of pups examined during the previous four years (Fig. 3 below). Pupping patterns similar to 2010 also were observed during 1998 and 1999; the last major El Niño years. El Niño oceanographic conditions are characterized by warmer coastal waters, which drive CSL prey (anchovies, sardines, etc.) greater distances from shore. Pregnant females and yearlings (1-year-olds) may not have the energy reserves to swim the extra distance to acquire food, resulting in females giving birth before reaching normal pupping areas, females abandoning pups because of diminished nutritional condition, and emaciation/starvation of yearlings. Reports of dead stranded yearlings also are greater than normal for 2009 and 2010. 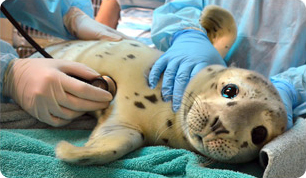 Postmortem examinations of CSLs at The Marine Mammal Center have revealed malnutrition as a primary cause of death in many cases (F. Gulland, personal communication). Domoic acid poisoning may also be a contributing factor in the unusual pupping patterns during 2010. Domoic acid is a neurotoxin produced by the diatom Pseudo-nitzschia spp. It accumulates in top-level predators during harmful algal blooms, and causes disorientation, lethargy, and seizures in CSLs. These neurological sympotoms prevent normal foraging, causing CSLs to become severely emaciated, sometimes resulting in death. Domoic acid may be transferred to unborn pups in pregnant females and has been associated with premature births in CSLs (Brodie et al. 2006, Goldstein et al. 2009). We may not know exactly what is causing the unusual CSL pupping circumstances in the Monterey Bay National Marine Sanctuary this year, but by documenting marine mammal strandings we can better track changes in the ecosystem. Information for reporting live and dead marine mammal strandings is listed below. Figure 1. Total number of dead stranded CSLs observed during beach surveys. Black bars indicate long-term averages, blue bars indicate counts from 2010 (Jan.-May), the striped bar indicates preliminary counts from June 2010 (not all datasheets have been received), and the orange line represents the trendline (TL) for “normal” numbers of CSL strandings. Counts above the TL indicate an unusual mortality event. Figure 2. Total numbers of live CSLs (all age classes) from Monterey and Santa Cruz counties admitted to The Marine Mammal Center as of June 15th 2008, 2009, 2010. Figure 3. CSL strandings (dead) reported in Monterey County to the NOAA Marine Mammal Stranding Network participant Moss Landing Marine Laboratories. Note 2010 data is a partial year (January to May). Under the direction of the National Marine Fisheries Service, The Marine Mammal Center will respond to a pup at PIER 39 if it is clearly abandoned and not surrounded by other animals. The overall goal is to avoid creating a negative situation for the other animals and to ensure safe access for the rescue team. It is a tricky balancing test to weigh all of the issues under extremely difficult and emotionally-charged circumstances. The Marine Mammal Center recognizes this and hopes to pursue the best course of action in each situation with the bigger picture in mind. Ultimately, the scientific community will learn from each set of circumstances and ideally emerge with knowledge that we can apply to future events. If you see something that concerns you at the Pier, please call The Marine Mammal Center at (415) 289-SEAL. Our experienced team will respond, assess the situation and act if needed. Call (415) 289-7361 today or email edu@tmmc.org.